However, you don’t just show up to a standard office anymore. You must create one yourself. Take a few tips from the experts as you build an office that reflects personality and productivity. Working from home can be a thrill with these office suggestions. Before you can decorate your home office, picking out its location is paramount. Consider your work habits first. Some people prefer ambient sounds, such as music, whereas other workers need absolute quiet for their career pursuits. These parameters will define where your office should reside. Carve out a corner in a sitting room when you can deal with some distractions. For a quiet workplace, you might need a separate room altogether. Think about converting an attic or outdoor shed that’s not in use. Home offices don’t have to be too large if it’s just one person they must support. If you meet with any clients, definitely pick a space that’s dedicated to your career. A separate entryway might be a good thought as well. 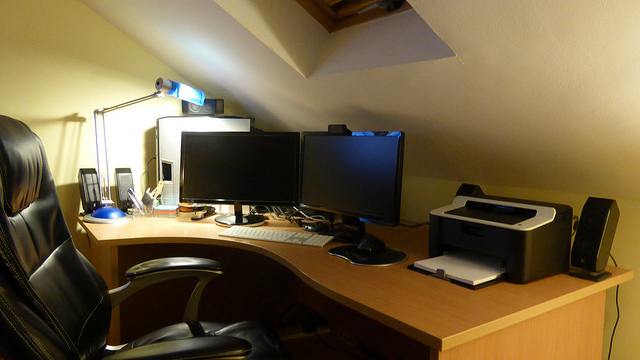 Be mindful of your needs and career trajectory as you create a home office. One of the most expensive parts of building a successful, home office is selecting furniture. Sturdy desks can cost hundreds of dollars in retail stores. Look for secondhand furniture at thrift shops and other locations. These pieces may have some wear to them, but a bit of effort on your part makes them distinct reflections of your personality. Sanding, painting and staining are options for wood desks. Be sure to choose furniture with a lot of storage space, such as drawers and integrated cabinets. These features will only help your productivity and improve professionalism among colleagues as they visit. Decorate with other selections, including bookcases, to fill in your space. Home offices aren’t necessarily large areas. You may only have a corner space to work with as you start at home. Don’t let the lack of square footage deter you. Look to the walls for inspiration. Line them with shelves and organizational elements that encourage productivity. The walls don’t have to be sterile places either. Add in a photo or piece of art that you enjoy. It breaks the monotonous tone of the wall that might be full of books, binders and papers. If you don’t have more than a small corner, create wall space with a standing bookshelf. Line the backside with lively colors so that your area is inspiring rather than confined. Place more than just a desk lamp in your home office. Consider recessed lighting above your work space. A dangling, light fixture is another option. Illuminate the space so that it improves your mood from the moment that you walk inside. If you have any visiting clients, the lighting impacts their mood as well. Lively areas encourage healthy discussions and possible career deals in the work space. Consider unusual lighting, such as string lights, when you’re in a creative industry. Writers, editors and the like seem to thrive when the lighting engages the mind. A standard workplace usually has ergonomic supplies for your health and wellness. Your household, however, may be a different story. Take care of your health by purchasing a few ergonomic items. Padded mousepads, keyboard pads and other supplies fight off carpal tunnel syndrome. Be aware of your posture in your chair too. If you cannot afford a brand-new chair with ergonomic features, deck it out with strategic padding. By taking care of your body, the work hours will fly by without any discomfort. Ignore these elements, and you might discover chronic ailments in your future. Working from home doesn’t mean that you’re immune to back or wrist problems brought on by poor posture. Because you work from home, you’re now accessible to family members and other distractions. Create a work schedule that’s just as dedicated as a standard, office job. Ask loved ones to hold their questions and concerns until you’ve completed the workday. You’ll keep up with your career pace without juggling too many distractions.